The Israeli–Palestinian conflict is the ongoing dispute between Israelis and Palestinians, and one of the most enduring and explosive of all the world's conflicts. The conflict is wide-ranging, and the term is also used in reference to the earlier phases of the same conflict, between Jewish and Zionist yishuv and the majority Arab population living in Palestine under Ottoman or British rule. It forms part of the wider, and generally earlier, Arab–Israeli conflict. The remaining key issues are: mutual recognition, borders, security, water rights, control of Jerusalem, Israeli settlements and legalities concerning refugees. The violence resulting from the conflict has prompted international actions, as well as other security and human rights concerns, both within and between both sides, and internationally. Many attempts have been made to broker a two-state solution, which would entail the creation of an independent Palestinian state alongside an independent Jewish state or next to the State of Israel (after Israel's establishment in 1948). As recently as 2007, a majority of both Israelis and Palestinians, according to a number of polls, prefer the two-state solution over any other solution as a means of resolving the conflict. Moreover, a considerable majority of the Jewish public sees the Palestinians' demand for an independent state as just, and thinks Israel can agree to the establishment of such a state. A majority of Palestinians and Israelis view the West Bank and Gaza Strip as an acceptable location of the hypothetical Palestinian state in a two-state solution. However, there are significant areas of disagreement over the shape of any final agreement and also regarding the level of credibility each side sees in the other in upholding basic commitments. An alternative is the one-state or binational solution, whereby all of Israel, the Gaza Strip, and West Bank would become a bi-national state with equal rights for all. Within Israeli and Palestinian society, the conflict generates a wide variety of views and opinions. This highlights the deep divisions which exist not only between Israelis and Palestinians, but also within each society. A hallmark of the conflict has been the level of violence witnessed for virtually its entire duration. Fighting has been conducted by regular armies, paramilitary groups, terror cells and individuals. Casualties have not been restricted to the military, with a large number of fatalities in civilian population on both sides. There are prominent international actors involved in the conflict. The two parties engaged in direct negotiation are the Israeli government, currently led by Benjamin Netanyahu, and the Palestine Liberation Organization (PLO), currently headed by Mahmoud Abbas. The official negotiations are mediated by an international contingent known as the Quartet on the Middle East (the Quartet) represented by a special envoy that consists of the United States, Russia, the European Union, and the United Nations. The Arab League is another important actor, which has proposed an alternative peace plan. Egypt, a founding member of the Arab League, has historically been a key participant. Since 2003, the Palestinian side has been fractured by conflict between the two major factions: Fatah, the traditionally dominant party, and its later electoral challenger, Hamas. 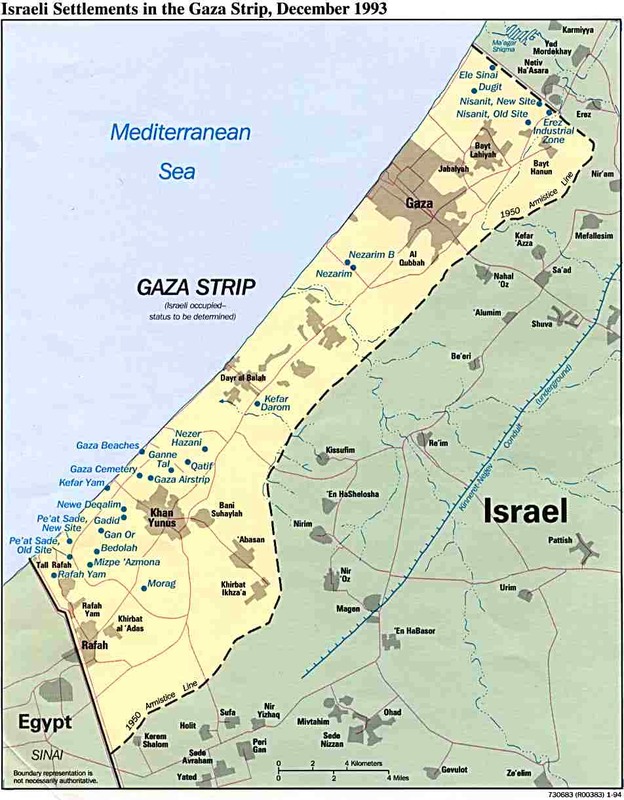 Following Hamas' seizure of power in the Gaza Strip in June 2007, the territory controlled by the Palestinian National Authority (the Palestinian interim government) is split between Fatah in the West Bank, and Hamas in the Gaza Strip. The division of governance between the parties has effectively resulted in the collapse of bipartisan governance of the Palestinian National Authority (PA). A round of peace negotiations began at Annapolis, Maryland, United States, in November 2007. These talks aimed at having a final resolution by the end of 2008. The parties agree there are six core, or 'final status,' issues which need to be resolved. late 19th century-1917: The period of the Ottoman Empire rule in Palestine in which the Palestinians saw themselves as part of the overall Arab territories which were under the rule of the Ottoman Empire. During that period, the disputes were on the basis of religious background and not on national background. 1917-1948: The period of the British Mandate of Palestine, in which both parties were under British rule and under a single political entity - called Palestine in English. During this period the term "The Israeli–Palestinian conflict" was not used and instead the conflict was referred to as "the Jewish-Arab conflict over the Land of Palestine" (by the Arab population and the British population), "the Jewish-Arab conflict over Erez-Israel" (by the Jewish population). 1948-1967: The period between the declaration of the State of Israel and the Six-Day War in which the parties resided in three separate political entities: The State of Israel, the Gaza Strip (which was controlled by Egypt) and the West Bank (which was annexed to Jordan). 1967-1993: The period between the Six-Day War and the Oslo Accords, in which the conflicted parties reside in the areas addressed by the UN Partition Plan that were under the control of the State of Israel. 1993-2000: The period between the Oslo Accords and the Second Intifada, in which Israel exists alongside the semi-sovereign political entity - the Palestinian Authority. 2000-present: The period between the beginning of the Second Intifada up until today, in which Israel returned to perform arresting operations in Area A zones in the West Bank and Gaza and later on retreated from the Gaza Strip in 2005. Israel's unilateral disengagement from the Gaza Strip inadvertently led to the strengthening of Hamas, which in 2007 took control over the Gaza Strip. Map of Palestinian Authority (dark green) and Israeli (light green) administered areas in the West Bank and Gaza Strip following the Oslo Accords. The agreement was that Israel would gradually cede control of territories over to the Palestinians in exchange for peace. In 1993, Israeli officials led by Yitzhak Rabin and Palestinian leaders from the Palestine Liberation Organization led by Yasser Arafat strove to find a peaceful solution through what became known as the Oslo peace process. A crucial milestone in this process was Arafat's letter of recognition of Israel's right to exist. In 1993, the Oslo Accords were finalized as a framework for future Israeli-Palestinian relations. The crux of the Oslo agreement was that Israel would gradually cede control of the Palestinian territories over to the Palestinians in exchange for peace. The Oslo process was delicate and progressed in fits and starts, the process took a turning point at the assassination of Yitzhak Rabin and finally came to a close when Arafat and Ehud Barak failed to reach agreement. Robert Malley, special assistant to United States President Bill Clinton for Arab-Israeli Affairs, has confirmed that Barak made no formal written offer to Arafat. Consequently, there are different accounts of the proposals considered. However, the main obstacle to agreement appears to have been the status of Jerusalem. In July 2000, U.S. President Bill Clinton convened a peace summit between Palestinian President Yasser Arafat and Israeli Prime Minister Ehud Barak. Barak reportedly offered the Palestinian leader approximately 95% of the West Bank and Gaza Strip, as well as Palestinian sovereignty over East Jerusalem, and that 69 Jewish settlements (which comprise 85% of the West Bank's Jewish settlers) would be ceded to Israel. He also proposed "temporary Israeli control" indefinitely over another 10% of the West Bank territory—an area including many more Jewish settlements. According to Palestinian sources, the remaining area would be under Palestinian control, yet certain areas would be broken up by Israeli bypass roads and checkpoints. Depending on how the security roads would be configured, these Israeli roads might impede free travel by Palestinians throughout their proposed nation and reduce the ability to absorb Palestinian refugees. President Arafat rejected this offer. President Clinton reportedly requested that President Arafat make a counter-offer, but he proposed none. No tenable solution was crafted which would satisfy both Israeli and Palestinian demands, even under intense U.S. pressure. Clinton blamed Arafat for the failure of the Camp David Summit. In the months following the summit, Clinton appointed former U.S. Senator George J. Mitchell to lead a fact-finding committee that later published the Mitchell Report aimed at restoring the peace process. The Israeli negotiation team presented a new map at the Taba Summit in Taba, Egypt in January 2001. The proposition removed the "temporarily Israeli controlled" areas, and the Palestinian side accepted this as a basis for further negotiation. However, Prime Minister Ehud Barak did not conduct further negotiations at that time; the talks ended without an agreement. The following month the right-wing Likud party candidate Ariel Sharon was elected as Israeli prime minister in February 2001. One peace proposal, presented by the Quartet of the European Union, Russia, the United Nations and the United States on September 17, 2002, was the Road Map for Peace. This plan did not attempt to resolve difficult questions such as the fate of Jerusalem or Israeli settlements, but left that to be negotiated in later phases of the process. Israel did not accept the proposal as written but called out 14 "reservations" or changes before they would accept it, which were unacceptable to the Palestinian leadership. The proposal never made it beyond the first phase, which called for a halt to Israeli settlement construction and a halt to Israeli and Palestinian violence, none of which was achieved. The Arab Peace Initiative (Arabic: مبادرة السلام العربية) was first proposed by Crown Prince Abdullah of Saudi Arabia in the Beirut Summit. The peace initiative is a proposed solution to the Arab-Israeli conflict as a whole, and the Israeli–Palestinian conflict in particular. The initiative was initially published on March 28, 2002, at the Beirut Summit, and agreed upon again in 2007 in the Riyadh Summit. The peace initiative achieved the unanimous consent of all members of the Arab League, including both the Hamas and Fatah Palestinian factions. Although the proposal was rejected outright by Israel when it was first proposed in 2002, the Arab League continues to raise it as a possible solution, and meetings between the Arab League and Israel have been held. According to Haaretz, Arab leaders had threatened in February 2008 to withdraw their proposal unless Israel explicitly expressed an acceptance of the initiative. Many Palestinians nowadays believe that Israel is not really interested in reaching an arrangement, but rather interested in continuing to control the entire territory from the Mediterranean Sea to the Jordan River. As proof of their claims, they point to the expansion of the Jewish settlements during the terms of the Israeli left-wing political parties, the argument that it has always been Israel which has conquered territory which belonged to Arab countries, that the IDF entered Palestinian towns during the intifada, as well as quotes of Israeli right-wing leaders and religious leaders who have expressed their support in a Greater Israel and in implementing a population transfer. On the other hand, many Israelis nowadays believe that the Palestinians’ true intentions are to conquer the Palestine region entirely and that their official claims are only a temporary strategy. As a proof to their claims, they note the rise of the Hamas, which has called for the takeover of all parts of Israel, incitement against Israel made in the Palestinian schools' textbooks and to the Palestinian political violence made against Israeli civilians within the Green Line borders. Due to the large number of opinions and interpretations, the question of the true demands of the parties is a political issue by itself, about which many Israelis and Palestinians disagree. A variety of concerns have emerged as key issues in seeking a negotiated settlement between the two sides. Since the Oslo Accords, finalized in 1993, the government of Israel and the Palestinian National Authority (PNA) have been officially committed to an eventual two-state solution. There are six core or 'final status' issues which need to be resolved. The border of Jerusalem is a particularly delicate issue, with each side asserting claims over this city. The three largest Abrahamic religions—Judaism, Christianity, and Islam—include Jerusalem as an important setting for their religious and historical narratives. Israel asserts that the city should not be divided and should remain unified within Israel's political control. Palestinians claim at least the parts of the city which were not part of Israel prior to June 1967. As of 2005, there were more than 719,000 people living in Jerusalem; 465,000 were Jews (mostly living in West Jerusalem) and 232,000 were Muslims (mostly living in East Jerusalem). The Israeli government, including the Knesset and Supreme Court, is centered in the "new city" of West Jerusalem and has been since Israel's founding in 1948. After Israel captured the Jordanian-controlled East Jerusalem in the Six-Day War, it assumed complete administrative control of East Jerusalem. In 1980, Israel issued a new law stating, "Jerusalem, complete and united, is the capital of Israel." At the Camp David and Taba Summits in 2000–01, the United States proposed a plan in which the Arab parts of Jerusalem would be given to the proposed Palestinian state while the Jewish parts of Jerusalem were retained by Israel. All archaeological work under the Temple Mount would be jointly controlled by the Israeli and Palestinian governments. Both sides accepted the proposal in principle, but the summits ultimately failed. Israel has grave concerns regarding the welfare of Jewish holy places under possible Palestinian control. When Jerusalem was under Jordanian control, no Jews were allowed to visit the Western Wall or other Jewish holy places, and the Jewish cemetery on the Mount of Olives was desecrated. In 2000, a Palestinian mob took over Joseph's Tomb, a shrine considered sacred by both Jews and Muslims, looted and burned the building and turned it into a mosque. There are unauthorized Palestinian excavations for construction on the Temple Mount in Jerusalem, which could threaten the stability of the Western Wall. Israel, on the other hand, has seldom blocked access to holy places sacred to other religions. Israeli security agencies routinely monitor and arrest Jewish extremists that plan attacks, resulting in almost no serious incidents for the last 20 years. Moreover, Israel has given almost complete autonomy to the Muslim trust (Waqf) over the Temple Mount. Israel expresses concern over the security of its residents if neighborhoods of Jerusalem are placed under Palestinian control. Jerusalem has been a prime target for attacks by militant groups against civilian targets since 1967. Many Jewish neighborhoods have been fired upon from Arab areas. The proximity of the Arab areas, if these regions were to fall in the boundaries of a Palestinian state, would be so close as to threaten the safety of Jewish residents. Nadav Shragai states this idea in his study for the Jerusalem Center for Public Affairs, "An Israeli security body that was tasked in March 2000 with examining the possibility of transferring three Arab villages just outside of Jerusalem - Abu Dis, Al Azaria, and a-Ram - to Palestinian security control, assessed at the time that: 'Terrorists will be able to exploit the short distances, sometimes involving no more than crossing a street, to cause damage to people or property. A terrorist will be able to stand on the other side of the road, shoot at an Israeli or throw a bomb, and it may be impossible to do anything about it. The road will constitute the border.' 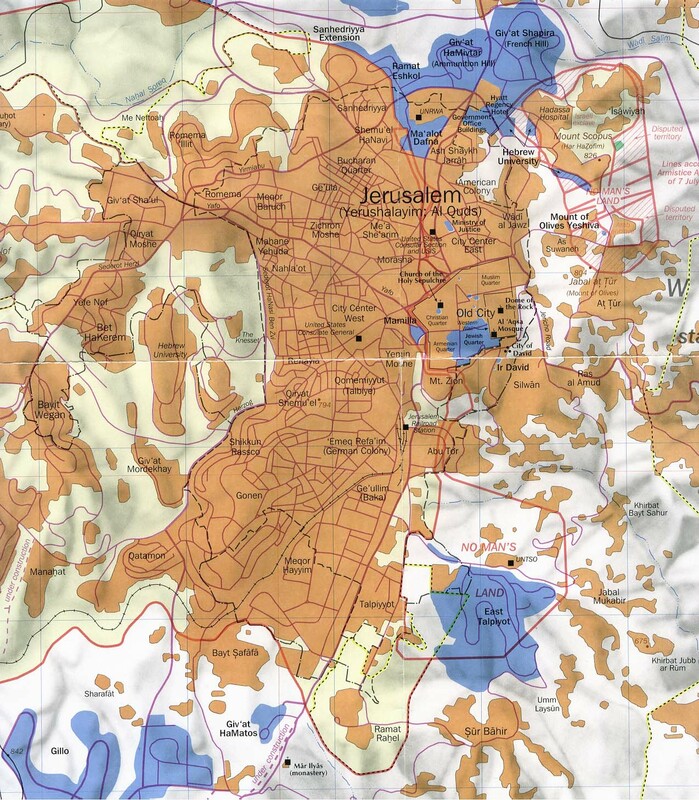 If that is the case for neighborhoods outside of Jerusalem's municipal boundaries, how much more so for Arab neighborhoods within those boundaries. Palestinians have grave concerns regarding the welfare of Christian and Muslim holy places under Israeli control. They point to the several attacks on the Al-Aqsa Mosque (Masjid al Aqsa) since 1967, including a serious fire in 1969 which destroyed the south wing, and the discovery in 1981 of ancient tunnels under the structure of the mosque which some archaeologists believe have weakened the building structures on the Al Aqsa Mosque. Some Palestinian advocates have made statements alleging that the tunnels were re-opened with the intent of causing the mosque's collapse. Israel considers these statements to be totally baseless and unfounded, and to be deliberately intended to incite aggression and public disorder, and stated this in a 1996 speech at the UN. The Israeli government claims it treats the Muslim and Christian holy sites with utmost respect. According to the United Nations Relief and Works Agency for Palestine Refugees in the Near East (UNRWA), a Palestinian refugee is a person whose normal place of residence was Palestine between June 1946 and May 1948, and who lost both their homes and means of livelihood as a result of the 1948 Arab-Israeli conflict. The number of Palestinians who fled or were expelled from Israel following its creation was estimated at 711,000 in 1949. Descendants of these original Palestinian Refugees are also eligible for registration and UNRWA services, and as of 2009 number 4.6 million people. One third of the refugees live in recognised refugee camps in Jordan, Lebanon, Syria, the West Bank and Gaza Strip. The remainder live in and around the cities and towns of these host countries. Most of the people described above were born outside of Israel. Nevertheless, Palestinian negotiators, most notably Yasser Arafat, have so far insisted that refugees have a right to return to the places where they lived before 1948 and 1967, including those within the 1949 Armistice lines, citing the Universal Declaration of Human Rights and UN General Assembly Resolution 194 as evidence. Several authors included in the broader New Historians assert that the Palestinian refugees were chased out or expelled by the actions of the Haganah, Lehi and Irgun. The traditional Israeli point of view arguing that Arab leaders encouraged Palestinian Arabs to flee has also been disputed by the New Historians, which instead have shown evidence indicating Arab leaders' will for the Palestinian Arab population to stay put. The Israeli Law of Return that grants citizenship to any Jew from anywhere in the world is viewed by some as discrimination towards non-Jews and especially to Palestinians that cannot apply for such citizenship nor return to the territory from which they were displaced or left. The strongest legal basis on the issue is UN Resolution 194, adopted in 1948. It states that, "the refugees wishing to return to their homes and live at peace with their neighbours should be permitted to do so at the earliest practicable date, and that compensation should be paid for the property of those choosing not to return and for loss of or damage to property which, under principles of international law or in equity, should be made good by the Governments or authorities responsible." UN Resolution 3236 "reaffirms also the inalienable right of the Palestinians to return to their homes and property from which they have been displaced and uprooted, and calls for their return". Resolution 242 from the UN affirms the necessity for "achieving a just settlement of the refugee problem"; however, Resolution 242 does not specify that the "just settlement" must or should be in the form of a literal Palestinian right of return. In the years following the Six-Day War, and especially in the 1990s during the peace process, Israel re-established communities destroyed in 1929 and 1948 as well as established numerous new settlements in the West Bank. These settlements are now home to about 350,000 people. Most of the settlements are in the western parts of the West Bank, while others are deep into Palestinian territory, overlooking Palestinian cities. These settlements have been the site of much intercommunal conflict. These actors have also called the settlements illegal under international law; furthermore, the International Court of Justice as well as international and Israeli human rights organizations consider the settlements illegal. However Israel disputes this; several scholars and commentators disagree, citing in 2005 recent historical trends to back up their argument, it has not changed the view of the international community and human rights organizations. As of 2006, 267,163 Israelis lived within the West Bank and East Jerusalem. The establishment and expansion of these settlements in the West Bank and (at the time) the Gaza Strip have been described as violations of the fourth Geneva Convention by the UN Security Council in several resolutions. The European Union and the General Assembly of the United Nations consider the settlements to be illegal. Proponents of the settlements justify their legality using arguments based upon Article 2 and 49 of the fourth Geneva Convention, as well as UN Security Council Resolution 242. On a practical level, some objections voiced by Palestinians are that settlements divert resources needed by Palestinian towns, such as arable land, water, and other resources; and, that settlements reduce Palestinians' ability to travel freely via local roads, owing to security considerations. Throughout the conflict, Palestinian political violence has been a concern for Israelis. Israel, along with the United States and the European Union, refer to the violence against Israeli civilians and military forces by Palestinian militants as terrorism. The motivations behind Palestinian violence against Israeli civilians are multiplex, and not all violent Palestinian groups agree with each other on specifics, however a common motive is to eliminate the Jewish state and replace it with a Palestinian Arab state. The most prominent Islamist groups, such as Hamas, view the Israeli–Palestinian conflict as a religious jihad. Kibbutz farmers inspect a rocket that landed in the civilian Kibbutz Sufa. A car near a civilian home can be seen in the background. The threat of Qassam rockets fired from the Palestinian Territories into Israel is also of great concern for Israeli defense officials. In 2006—the year following Israel's disengagement from the Gaza Strip—the Israeli government recorded 1,726 such launches, more than four times the total rockets fired in 2005. There is significant debate within Israel about how to deal with the country's security concerns. Options have included military action (including targeted killings and house demolitions of terrorist operatives), diplomacy, unilateral gestures toward peace, and increased security measures such as checkpoints. The legality and the wisdom of all of the above tactics have been called into question by various commentators. Palestinians insist on contiguous territory which will in turn rupture the existing territorial contiguity of Israel. In the interim agreements reached as part of the Oslo Accords, the Palestinian Authority has received control over cities (Area A) while the surrounding countryside has been placed under Israeli security and Palestinian civil administration (Area B) or complete Israeli control (Area C). Israel has built additional highways to allow Israelis to traverse the area without entering Palestinian cities. The initial areas under Palestinian Authority control are diverse and non-contiguous. The areas have changed over time because of subsequent negotiations, including Oslo II, Wye River and Sharm el-Sheik. 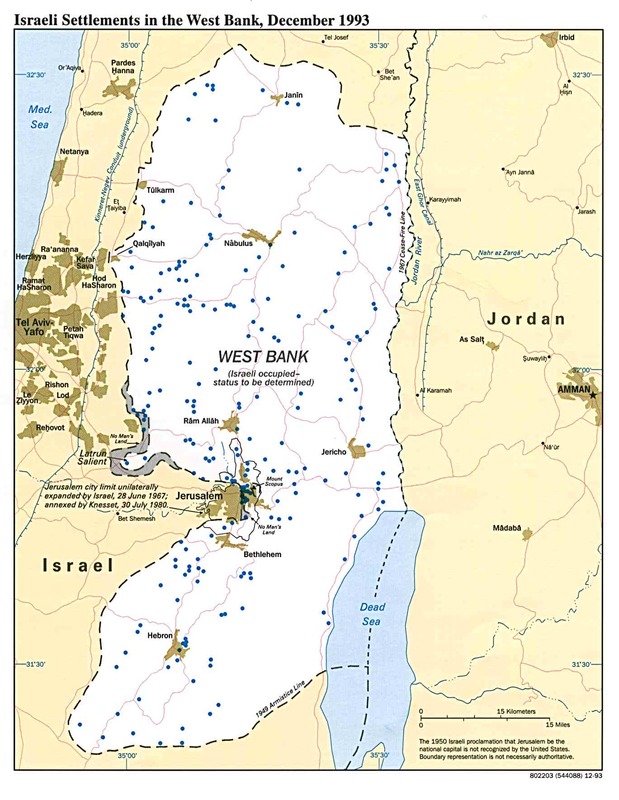 According to Palestinians, the separated areas make it impossible to create a viable nation and fails to address Palestinian security needs; Israel has expressed no agreement to withdrawal from some Areas B, resulting in no reduction in the division of the Palestinian areas, and the institution of a safe pass system, without Israeli checkpoints, between these parts. Because of increased Palestinian violence to occupation this plan is in abeyance. The number of checkpoints has increased, resulting in more suicide bombings since the early summer of 2003. Neither side has publicized a proposal for a final map. (Some maps have been leaked. These, purporting to show Israeli proposals, are reputed to come from the Israelis and the Palestinians). Palestinians note, as one of their most central concerns, that their society must be given land and resources with enough contiguity to give them a viable society, and that they must therefore not be forced to give up too many resources to Israel, as this may cause economic collapse. In the Middle East, water resources are of great political concern. Since Israel receives much of its water from two large underground aquifers which continue under the Green Line, the use of this water has been contentious in the Israeli–Palestinian conflict. Since some of the wells used to draw this water lie within the Palestinian Authority areas, there are many who question the legality of using the water for Israeli needs. But critics of this argument say that even though Israel withdraws some water from these areas, it also supplies the West Bank with approximately 40 MCM annually, contributing to 77% of Palestinians' water supply in the West Bank, which is to be shared for a population of about 2.3 million. While Israel's consumption of this water has decreased since it began its occupation of the West Bank, it still consumes the majority of it: in the 1950s, Israel consumed 95% of the water output of the Western Aquifer, and 82% of that produced by the Northeastern Aquifer. Although this water was drawn entirely on Israel's own side of the pre-1967 border, the sources of the water are nevertheless from the shared groundwater basins located under both West Bank and Israel. By 1999, these numbers had declined to 82% and 80%, respectively. In the treaty of the Oslo II Accord, both sides agreed to maintain "existing quantities of utilization from the resources." In so doing, the Palestinian Authority established unequivocally the legality of Israeli water production in the West Bank. Moreover, Israel obligated itself in this agreement to provide water to supplement Palestinian production, and further agreed to allow additional Palestinian drilling in the Eastern Aquifer. Many Palestinians counter that the Oslo II agreement was intended to be a temporary resolution and that it was not intended to remain in effect more than a decade later. Indeed its name is "The Israeli-Palestinian Interim Agreement." This agreement also established the right of the Palestinian Authority to explore and drill for natural gas, fuel and petroleum within its territory and territorial waters. It also delineated the major terms of conduct regarding regulations on the parties' facilities. A variety of concerns have become prominent issues between the two sides in regards to ongoing day-to-day interactions, and actions by either side towards the other. Occupied Palestinian Territory is the term used by the United Nations to refer to the West Bank, including East Jerusalem, and the Gaza Strip—territories which were conquered by Israel during the 1967 Six-Day War, having formerly been controlled by Egypt and Jordan. The Israeli government uses the term Disputed Territories, to indicate its position that some territories cannot be called occupied as no nation had clear rights to them and there was no operative diplomatic arrangement when Israel acquired them in June 1967. The area is still referred to as Judea and Samaria by some Israeli groups, based on the historical regional names from ancient times. In 1980, Israel explicitly annexed East Jerusalem. The United Nations rejected this annexation on August 20, 1980. Israel has never annexed the West Bank or Gaza Strip, and the United Nations has demanded the "[t]ermination of all claims or states of belligerency and respect for and acknowledgement of the sovereignty, territorial integrity and political independence of every State in the area and their right to live in peace within secure and recognized boundaries free from threats or acts of force" and that Israeli forces withdraw "from territories occupied in the recent conflict" - the meaning and intent of the latter phrase is disputed. See Semantic dispute. It has been the position of Israel that the most Arab-populated parts of West Bank (without major Jewish settlements), and the entire Gaza Strip must eventually be part of an independent Palestinian State. However, the precise borders of this state are in question. In 2000, for example, Ehud Barak offered Yasser Arafat an opportunity to establish an independent Palestinian State composed of the entire Gaza Strip and 92% of the West Bank. Because of security restrictions, and Barak's opposition to a broad right of return, Arafat refused this proposal. Some Palestinians claim they are entitled to all of the West Bank, Gaza Strip, and East Jerusalem. Israel says it is justified in not ceding all this land, because of security concerns, and also because the lack of any valid diplomatic agreement at the time means that ownership and boundaries of this land is open for discussion. Palestinians claim any reduction of this claim is a severe deprivation of their rights. In negotiations, they claim that any moves to reduce the boundaries of this land is a hostile move against their key interests. Israel considers this land to be in dispute, and feels the purpose of negotiations is to define what the final borders will be. Other Palestinian groups, such as Hamas, have in the past insisted that Palestinians must control not only the West Bank, Gaza Strip, and East Jerusalem, but also all of Israel proper. For this reason, Hamas has viewed the peace process "as religiously forbidden and politically inconceivable". The Oslo peace process was based upon Israel ceding authority to the Palestinians to run their own political and economic affairs. In return, it was agreed that Palestinians would promote peaceful co-existence, renounce violence and promote recognition of Israel among their own people. Despite Yasser Arafat's official renunciation of terrorism and recognition of Israel, some Palestinian groups continue to practice and advocate violence against civilians and do not recognize Israel as a legitimate political entity. Palestinians state that their ability to spread acceptance of Israel was greatly hampered by Israeli restrictions on Palestinian political freedoms, economic freedoms, civil liberties, and quality of life. Many feel that their own opposition to Israel was justified by Israel's apparent stifling of any genuine Palestinian political and economic development. It is widely felt among Israelis that Palestinians did not in fact promote acceptance of Israel's right to exist. One of Israel's major reservations in regards to granting Palestinian sovereignty is its concern that there is not genuine public support by Palestinians for co-existence and elimination of terrorism and incitement. Some Palestinian groups, notably Fatah, the political party founded by PLO leaders, claim they are willing to foster co-existence if Palestinians are steadily given more political rights and autonomy. In 2006, Hamas won a majority in the Palestinian Legislative Council, where it remains the majority party. While Hamas has openly stated in the past that it completely opposed Israel's right to exist, and its charter states this, there is evidence that its position may have softened by 2006. However, Israel contended in 2007 that Hamas has refused to recognize Israel in any valid way, and that it supported recent rocket attacks on Israel. In June 2009, Hamas leaders met with former US President Jimmy Carter, and said that Hamas does not in any way recognize Israel. Israel cites past concessions—such as Israel’s disengagement from the Gaza Strip in August 2005, which did not lead to a reduction of attacks and rocket fire against Israel—as an example of the Palestinian people not accepting Israel as a state. Palestinian groups and Israeli Human Rights organizations (namely B'Tselem) have pointed out that while the military occupation in Gaza was ended, the Israeli government still retained control of Gaza's airspace, territorial water, and borders, legally making it still under Israeli control. They also say that mainly thanks to these restrictions, the Palestinian quality of life in the Gaza Strip has not improved since the Israeli withdrawal. Furthermore, given that the Israeli army has run incursions into the Gaza Strip on various occasions, closed off its borders, and placed an embargo on the region, the Gazan economy has since gone into free fall. This has led and continues to result in warnings of the Palestinian population becoming more radicalized unless conditions improve. The Palestinian Authority is considered corrupt by a wide variety of sources, including some Palestinians. Some Israelis argue that it provides tacit support for extremists via its relationship with Hamas and other Islamic terrorist movements, and that therefore it is unsuitable for governing any putative Palestinian state or (especially according to the right wing of Israeli politics), even negotiating about the character of such a state. Because of that, a number of organizations, including the previously ruling Likud party, declared they would not accept a Palestinian state based on the current PA. (Likud's former leader Ariel Sharon publicly declared that he rejected this position as too radical). A PA Cabinet minister, Saeb Erekat, declared this indicates that Israel is seeking to maintain its occupation of the West Bank and Gaza. Israel has not recognised a Palestinian state, and has carried out extrajudicial killings of suspects within the West Bank and Gaza whom it claims have planned and led terrorist attacks within Israel. Some international observers have recommended that negotiations proceed anyway, claiming that internal Palestinian reform can be undertaken if negotiations make progress. Some Israelis are concerned that key Palestinian leaders have promoted incitement against and overall non-acceptance of Israel, including promotion of violence against Israel. Some Palestinians are concerned that key Israeli leaders have refused to accept the reality of the Palestinian people and have been defended violence against Palestinians. Because of an import-export ban imposed on Gaza in 2007, 95% of Gaza’s industrial operations were suspended. Out of 35,000 people employed by 3,900 factories in June 2005, only 1,750 people remained employed by 195 factories in June 2007. Closures have severely hindered health services in Gaza. During the period October to December 2007, the World Health Organization has confirmed the deaths of 20 patients, including 5 children. Between 2007-2008, 120 people in Gaza died because they were not allowed to access medical treatment. The Israeli Government's cut in the flow of fuel and electricity to the Gaza Strip has also been called collective punishment of the civilian population, which would be a violation of Israel’s obligations under the laws of war. Starting February 7, 2008, the Israeli Government reduced the electricity it sells directly to Gaza. This follows the ruling of Israel’s High Court of Justice’s decision, which held, with respect to the amount of industrial fuel supplied to Gaza, that, “The clarification that we made indicates that the supply of industrial diesel fuel to the Gaza Strip in the winter months of last year was comparable to the amount that the Respondents now undertake to allow into the Gaza Strip. This fact also indicates that the amount is reasonable and sufficient to meet the vital humanitarian needs in the Gaza Strip.” The Jerusalem Post argued that Palestinians had killed two Israelis in the process of delivering fuel to the Nahal Oz fuel depot. With regard to Israel’s plan, the Court stated that, “calls for a reduction of five percent of the power supply in three of the ten power lines that supply electricity from Israel to the Gaza Strip, to a level of 13.5 megawatts in two of the lines and 12.5 megawatts in the third line, we [the Court] were convinced that this reduction does not breach the humanitarian obligations imposed on the State of Israel in the framework of the armed conflict being waged between it and the Hamas organization that controls the Gaza Strip. Our conclusion is based, in part, on the affidavit of the Respondents indicating that the relevant Palestinian officials stated that they can reduce the load in the event limitations are placed on the power lines, and that they had used this capability in the past." During the British Mandate and after 1919, when unrest started to become widespread, the term "collective punishment" was freely used by the British government to refer to measures they took against Arabs when unknown Arabs attacked Jews or Jews when unknown Jews attacked Arabs. In that era, it meant closure of shops, restriction of movement, and taxes or fines levied on towns as punishment. Supporters of Israel have argued that Palestinian violence against Israeli civilians constitutes collective punishment of Palestinians for the actions of their government. The West Bank and Israel form a strip only up to 80 kilometres wide. Israel has insisted on complete Israeli control of the airspace above the West Bank and Gaza as well as that above Israel itself. A Palestinian compromise of joint control over the combined airspace has been rejected by Israel. The Israeli Cabinet issued a statement expressing that it does not wish the Palestinians to build up an army capable of offensive operations, considering that the only party against which such an army could be turned in the near future is Israel itself. However, Israel has already allowed for the creation of a Palestinian police that can conduct police operations and also carry out limited-scale warfare. Palestinians have argued that the Israel Defense Forces, a large and modern armed force, poses a direct and pressing threat to the sovereignty of any future Palestinian state, making a defensive force for a Palestinian state a matter of necessity. To this, Israelis claim that signing a treaty while building an army is a show of bad intentions. In December 2009, the Israeli government ordered a 10-month lull in permits for new settlement homes in the West Bank. The restrictions, which Israeli politicians and media have referred to as a "freeze", do not apply to East Jerusalem (whose annexation by Israel is not recognised internationally), municipal buildings, schools, synagogues and other community infrastructure in the settlements. About 3,000 homes already under construction will be allowed to proceed. The Israeli government said the move was aimed at restarting peace talks, but Palestinian officials said it was insufficient. Palestinian officials have refused to rejoin peace talks unless a total building halt is imposed, including in East Jerusalem. The announcement followed calls by the US government for a total freeze in settlement building. The US government, the European Union, Russia and the UN have criticized Israel's plans to continue building in East Jerusalem but both the US and the EU have stated that neither the Palestinians nor Israel should have preconditions for resuming the suspended peace talks. The Office for the Coordination of Humanitarian Affairs for the occupied Palestinian territory (OCHoPT) was established in late 2000 by the United Nations as a response to the deteriorating humanitarian situation in the West Bank and Gaza caused by military incursions and closures (See also: Second Intifada). The office monitors the conflict and presents figures relating to both internal-violence and direct conflict clashes. B'Tselem, an Israeli non-governmental organization, also maintains comprehensive statistics on the conflict for both the First Intifada and the Second Intifada. Figures include both Israeli civilians and security forces and casualties in both the Occupied Territories and Israel. Morris, Righteous Victims p 159. These figures represent deaths caused by the Palestinian uprising against the British mandatory government in Palestine, and include those killed by the British. A comprehensive collection mechanism to gather land mine and explosive remnants of war (ERW) casualty data does not exist for the Palestinian territories. In 2009, the United Nations Mine Action Centre reported that more than 2,500 mine and explosive remnants of war casualties occurred between 1967 and 1998, at least 794 casualties (127 killed, 654 injured and 13 unknown) occurred between 1999 to 2008 and that 12 people have been killed and 27 injured since the Gaza War. The UN Mine Action Centre identified the main risks as coming from "ERW left behind by Israeli aerial and artillery weapon systems, or from militant caches targeted by the Israeli forces." There are at least 15 confirmed minefields in the West Bank on the border with Jordan. The Palestinian National Security Forces do not have maps or records of the minefields. The source of the Jewish public's scepticism — and even pessimism — is apparently the widespread belief that a peace agreement based on the "two states for two peoples" formula would not lead the Palestinians to end their conflict with Israel. ^ Hussein Agha and Robert Malley, 'Camp David: The Tragedy of Errors', The New York Review of Books, Volume 48, Number 13, August 9, 2001. ^ Selby, 2003, p. 185. ^ Propositions israéliennes, de Camp David (2000) à Taba (2001), Reconstruction by Le Monde Diplomatique, accessed April 22, 2007. ^ Hussein Agha and Robert Malley, 'Camp David and After: An Exchange (2. A Reply to Ehud Barak)', The New York Review of Books, Volume 49, Number 10, June 13, 2002. ^ Benny Morris and Ehud Barak, Reply by Hussein Agha and Robert Malley, 'Camp David and After—Continued', The New York Review of Books, Volume 49, Number 11, June 27, 2002. ^ Enderlin, 2003, p. 263-264. ^ a b c Sela, Avraham. "Jerusalem." The Continuum Political Encyclopedia of the Middle East. Ed. Avraham Sela. New York: Continuum, 2002. pp. 491-498. ^ Gold, Dore. The Fight for Jerusalem: Radical Islam, the West, and the Future of the Holy City. Washington, DC: Regnery Publishing, Inc., 2007. p. 5-6. ^ "JCPA ME Diplomacy-Jerusalem: The Dangers of Division". www.jcpa.org. October 2008. http://www.jcpa.org/text/shragai_last2.pdf. Retrieved January 5, 2009. ^ Israel's Position Regarding the Current Political Situation, Israel Ministry of Foreign Affairs, 26 Sep 1996; A Critical Analysis of Security Council Resolution 1073, 1 Oct 1996. ^ FM Levy- Address to the UN Security Council, Israel Ministry of Foreign Affairs, Sept 27, 1996. ^ "General Progress Report and Supplementary Report of the United Nations Conciliation Commission for Palestine, Covering the Period from 11 December 1949 to 23 October 1950". United Nations Conciliation Commission for Palestine. 1950. http://domino.un.org/unispal.nsf/9a798adbf322aff38525617b006d88d7/93037e3b939746de8525610200567883!OpenDocument. Retrieved November 20, 2007. ^ Efrat, Moshe. "Refugees." The Continuum Political Encyclopedia of the Middle East. Ed. Avraham Sela. New York: Continuum, 2002. pp. 724–729. ^ a b c Eran, Oded. "Arab-Israel Peacemaking." Sela, The Continuum Political Encyclopedia. 121-147. ^ Muasher, Marwan. "The Arab Peace Initiative." Embassy of Jordan - Washington, D.C. 16 January 2008. The text of the Arab Peace Initiative is at the bottom of the page. 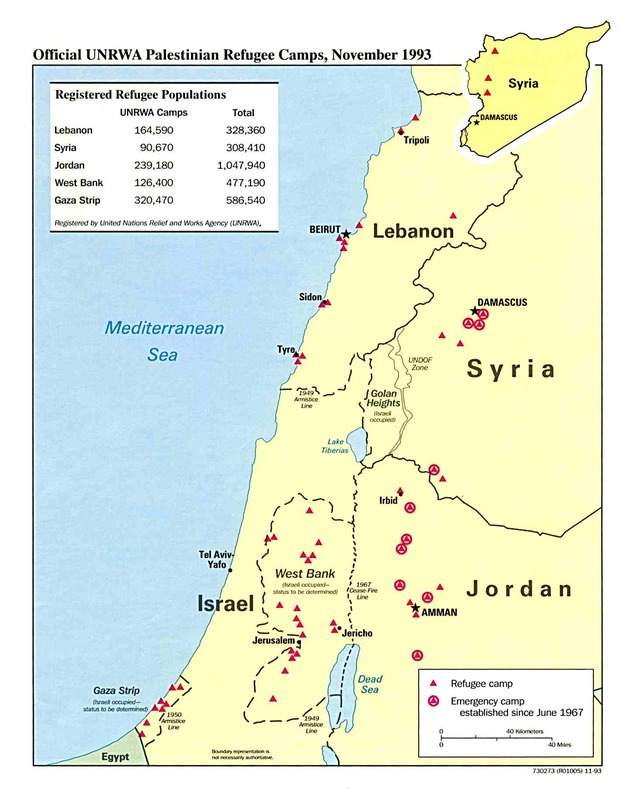 ^ Flapan, Simha (1987):The Palestinian Exodus of 1948. Journal of Palestine Studies, Vol. 16, No. 4. (Summer, 1987), pp. 3-26. ^ Khalidi, Rashid I. (1992): Observations on the Right of Return. Journal of Palestine Studies, Vol. 21, No. 2. (Winter, 1992), pp. 29-40. ^ See for example, Masalha, Nur-eldeen (1988):On Recent Hebrew and Israeli Sources for the Palestinian Exodus, 1947-49. Journal of Palestine Studies, Vol. 18, No. 1, Special Issue: Palestine 1948. (Autumn, 1988), pp. 121-137. and Childers, Irskine (1961): The Other Exodus. The Spectator (London), May 12, 1961. ^ Jonathan Cook considers the support for the Israeli Law of Return together with the opposition towards Palestinian Right of Return as a way that "maintains the act of ethnic cleansing that dispossessed the Palestinian refugees more than half a century ago." ^ Radley, K.René (1978): The Palestinian Refugees: The Right to Return in International Law. The American Journal of International Law, Vol. 72, No. 3 (Jul., 1978), pp. 586-614. ^ Bard, Mitchell G. "Myths & Facts - The Peace Process." Jewish Virtual Library. 14 February 2009. ^ Israel Min of Foreign Affairs Q&A doc; Palestinian refugees issue MFA website, accessed 1/16/08. ^ Why did Palestinian Refugees flight ? on the official website of the Israeli Ministry of Foreign Affairs (retrieved 8 April 2008). ^ Nakba on electronic intifada website. ^ Alwaya, Semha. "The vanishing Jews of the Arab world / Baghdad native tells the story of being a Middle East refugee." SFGate. 6 March 2005. 19 January 2009. ^ Do Palestinian Refugees Have a Right to Return to Israel? by Ruth Lapidoth, MFA website, 1/15/01. (See section labeled "Conclusions." ^ Interparliamentary European Security and Defence Assembly. ^ The Israeli Committee Against House Demolitions. A Human Rights Review on the EU and Israel. ^ Israel confirms settlement growth, BBC, 21 March 2005. ^ Bard, Mitchell G. "Myths & Facts - Settlements." Jewish Virtual Library. 9 July 2007. ^ Report: 12,400 new settlers in 2006. Tovah Lazaroff. Jerusalem Post. ^ Rostow, Eugene. Resolved: are the settlements legal? Israeli West Bank policies, The New Republic, October 21, 1991. ^ "Special Update: Disengagement - August 2005". Israeli Ministry of Foreign Affairs. ^ a b "Occupied Territories" to "Disputed Territories" by Dore Gold, Jerusalem Center for Public Affairs, January 16, 2002. Retrieved September 29, 2005. ^ Review of Dennis Ross book, by Ray Hanania, (hanania.com), 8/16/04, accessed 7/11/07. ^ 'Obama Speech In Cairo: VIDEO, Full Text', The Huffington Post, June 4, 2009. ^ a b "Victims of Palestinian Violence and Terrorism since September 2000". Israeli Ministry of Internal Affairs. http://www.mfa.gov.il/MFA/Terrorism-+Obstacle+to+Peace/Palestinian+terror+since+2000/Victims+of+Palestinian+Violence+and+Terrorism+sinc.htm. Retrieved April 10, 2007. ^ "Palestinian Anti-Terrorism Act of 2006." Global Legal Information Network. 26 December 2006. 30 May 2009. ^ Sela, Avraham. "Terrorism." The Continuum Political Encyclopedia of the Middle East. Ed. Sela. New York: Continuum, 2002. pp. 822-836. ^ a b Sela, Avraham. "Hamas." The Continuum Political Encyclopedia of the Middle East. Ed. Avraham Sela. New York: Continuum, 2002. pp. 335-342. ^ "Palestinians grow by a million in decade". The Jerusalem Post. February 9, 2008. http://www.jpost.com/servlet/Satellite?pagename=JPost%2FJPArticle%2FShowFull&cid=1202246355071. Retrieved December 7, 2008. ^ Messerschmid, Clemens (2002). "Till the Last Drop: The Palestinian Water Crisis in the West Bank, Hydrogeology and Hydropolitics of a Regional Conflict". http://www.juragentium.unifi.it/en/surveys/palestin/water.pdf. Retrieved November 29, 2008. ^ a b The Israeli-Palestinian Interim Agreement - Annex I. Israeli Ministry of Foreign Affairs. September 5, 1995. ^ "Israeli practices affecting the human rights of the Palestinian people in the Occupied Palestinian Territory, including East Jerusalem : report of the Secretary-General". United Nations. November 5, 2008. http://www.unhcr.org/refworld/country,,,COUNTRYREP,PSE,4562d8cf2,4917ee8b2,0.html. Retrieved April 16, 2009. ^ a b Dershowitz, Alan (2003). The Case for Israel. Wiley. ISBN 0-471-46502-X. ^ a b c Israel Foreign Ministry: Behind the Headlines: Hamas’ incitement - Israeli Min of Foreign Affairs website, accessed 2/12/07. ^ a b c Palestinian Incitement of Suicide Bombings, 18 May 2001 MFA website. ^ Address by FM Livni to the Paris Donors Conference, Israeli Ministry of Foreign Affairs, 12/17/07, Paris Donors' Conferences. (Scroll down to paragraph begininning This is neither...). ^ "Hamas's charter uncompromisingly seeks Israel's destruction." "Palestinian Rivals: Fatah & Hamas", BBC News, May 25, 2006. ^ Palestinian PM Haniyeh: Recognition of Israel is out of the question, 3 Jun 2007, Israeli Min of Foreign Affairs website, accessed 1/17/07. ^ Terror in Gaza: Eight months since the Hamas takeover, Israel Min. of Foreign Affairs, 14 Feb 2008. ^ Hamas rejects Carter plea to recognize Israel By Ben Hubbard, The Associated Press, June 17, 2009. ^ Sela, Avraham. "Palestinian Authority." The Continuum Political Encyclopedia of the Middle East. Ed. Avraham Sela. New York: Continuum, 2002. pp. 673-679. ^ Bard, Mitchell G. Will Israel Survive? New York: Palgrave Macmillan, 2007. ^ Massad, Joseph. "The (Anti-) Palestinian Authority." Al Ahram Weekly. 15-21 June 2006. 8 May 2008. ^ "Murder at the border." Jerusalem Post. 9 April 2008. 17 April 2008. ^ "Israeli Cabinet Statement on Road Map and 14 Reservations." Jewish Virtual Library. 8 April 2008. ^ a b c d e f g "Jewish settlers in West Bank building curb protest". BBC. 2009-12-09. http://news.bbc.co.uk/2/hi/middle_east/8404850.stm. Retrieved 12 December 2009. ^ a b The Humanitarian Monitor, December 2007, tables on pages 5 and 7, all numbers refer to casualties of the direct conflict as defined therein (page 23). ^ a b Data tabulated from B'Tselem Statistics, Fatalities, Note that the data may change due to ongoing research, which produces new information about the events. ^ a b c d "Country Overviews - Occupied Palestinian Territory". United Nations Mine Action Service. 2009. http://www.mineaction.org/country.asp?c=138. Retrieved 2 February 2010. Gaza\Sderot : Life in spite of everything - a webdocumentary produced by arte.tv, in which daily video-chronicles (2 min. each) show the life of 5 people (men, women, children) in Gaza and Sderot, on both sides of the border. Aix Group - Joint Palestinian-Israeli-international economic working group. The Israeli-Palestinian Conflict--An overview of the conflict between Israel and the Palestinians from 1948 through the present day. From the History Guy Website. The Media Line - A non-profit news agency which provides credible, unbiased content, background and context from across the Middle East. Palestine Solidarity Project Palestinian grassroots organizing and reporting. Background to the Israel-Palestine Crisis--Q & A format overview by Stephen Shalom, who teaches political science at William Paterson University in New Jersey. Exchange of friendly fire Anat el-Hashahar, an Israeli and founder of METalks, debates the Arab-Israeli conflict – from Oslo to Lebanon – with Khaled Diab, an Egyptian journalist and writer.